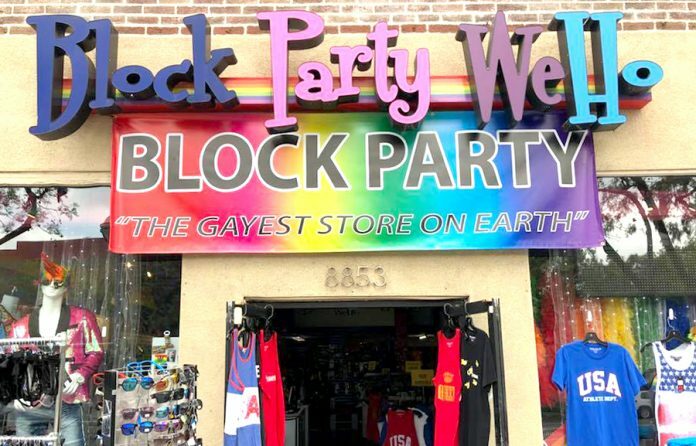 Block Party - "The Gayest Store on Earth" Facebook screen grab. If you noticed extra police presence on WeHo’s Boystown area around the corner of Santa Monica Boulevard and San Vicente Boulevard this week, it could be in response to the recent threats and homophobic harassment of gay clothing store Block Party WeHo. According to Larry Block, the owner of “The gayest store on earth,” the colorful clothing store has been a victim of numerous threatening, harassing and homophobic calls this past weekend on the eve of Martin Luther King Jr Day. Block eventually called the Sheriff’s who showed up at his home. There was an immediate response in the comments section from friends who are concerned for his safety and the safety of those who work at the store. “They come for you, they come for the ENTIRE community,” posted Kris Scott-Slawosky. West Hollywood Mayor Pro-Tempore, John D’Amico, chimed in to let Block know that he had called Kristin Cook, the City of West Hollywood’s Public Safety Director and that she would follow up with the Sheriffs. He also thanked D’Amico and council member Lindsey Horvath and other city officials for the quick follow with the hastags: #quickresponseweho #hatecrimesstillhappen #notinmybackyard. This is a reminder that if you see something, say something.